/ Posts Tagged "Christian education"
Tears ran down Petro’s cheeks. “You do not understand! My father will take me out of school if he finds out I am still a Christian!” He turned his face away to hide a fresh stream of tears. For a whole year Petro tried everything he could to fund his own education. He made and sold charcoal, he sold grilled corn at the bus stands and did anything else he could think of to earn a few coins—but eventually he found that these jobs did not pay. Not only that, but in his struggle to support himself he used up the time needed for his studies, and began failing. Dropping out of the government school, he tried again to earn money to at least attend an artisan school. No success—he was exploited by people who paid almost nothing. Weary of the struggle, Petro devised a ruse: He would go to his father and tell him he had renounced Christianity—but he would still keep his faith in his heart. At Petro’s verbal denial of faith, his overjoyed father decided to send him back to school. Government school was out of the question since Petro had fallen so far behind. Private school was much too expensive. However, Petro’s father had heard of one private vocational school that might be affordable—and his own sister was working there as a cook. After inquiring about the price, Petro’s father sent him to our school—not knowing that our school is Christian! 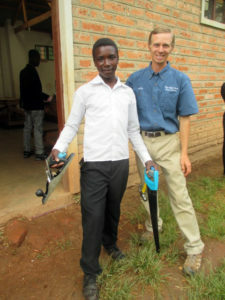 Eager to learn carpentry, Petro arrived at Eden Valley Foster Care Mission full of hope. When he discovered that his new school was run by Christians, he was even more delighted. Then, a few weeks after his arrival here, Petro’s story came out. We knew we would have to confront him about the deception. Taking Petro aside, we told him about God’s commandment against bearing false witness. We explained that for Christians, there is no ethical lie—no small lie for a good cause. At last, Petro conceded. We prayed with him for God to grant him wisdom. Then we handed him the phone so that he could call his father. The voice of his father came through loud and harsh. “Petro! Do not tempt me today!” Then his father hung up. We tried to reach him again, but he wouldn’t answer. Petro hung his head low as he walked back to the dormitory. Kneeling together, we both asked God for a manifestation of His love and power in the life of this young man who had taken his stand for truth. Since we couldn’t expect his father to pay tuition anymore, we prayed specifically for a sponsor for Petro. Furthermore, we prayed that the father would allow him to stay in school, since legally he could come and remove him anytime. At age 15, Petro was still considered a child. A few days later, the Lord provided a sponsor for Petro. Better yet, his father never came to force him to leave. We praised the Lord! When he was sure that he could stay and we would not send him home for lack of payment, Petro’s childlike joy returned and he set about learning all that he could. Although not the brightest academic student, we found him strong and hard-working with his hands. When Petro’s grandfather came to visit, our hearts warmed to see Petro reading the Bible with him. A little faith hero! Since his father does not support him financially, Petro takes chores from staff members on weekends or after school—working in gardens, cutting firewood, and doing little jobs with Elisha. This enables him to buy personal necessities and save for the bus ride home for school break. Although normally he is hard working, we did catch him taking a snooze once in the heat of the work! It was 11 am when we found him sprawled on the grass—but after an hour he resumed his work as if nothing had happened. When we asked him if he had a good nap, he gave us one of his bright smiles and scratched his head in embarrassment. We didn’t blame him—it was the day after our school’s graduation, and all of us had lost sleep in the preparation and cleanup. Before leaving for home on break, Petro asked to buy one of the baskets the girls had made in their craft class, saying, “I want to bring a present to my mother.” For his father, Petro brought a stool he had made himself. It’s beautiful to see Petro’s love and forgiveness for his parents after all he has been through. Petro is one of hundreds of children Eden Valley has been able to help—children who due to their social status have dropped out of secondary school. Eden Valley Foster Care Mission seeks to empower these young people to lead successful, self-sufficient lives and to give them a personal experience with Christianity. With one Seventh-day Adventist Church member for every 1,818 inhabitants in our region, our team’s goal is to see these young people return to their villages equipped to support themselves and impact their communities. Will you join us in praying for Petro and others like him, that they may become bright witnesses for God in Tanzania? What a loving God we serve! In His mercy He has given us a few more moments to perfect our characters for His return and to spread the gospel to the many who have not yet heard. We thank the Father for the small part that we have had in His service here in Kenya. In spite of the many challenges we have faced this last year, the gospel continues to go forward. When our original orphanage near Kisii, Kenya reached its max capacity of 81 children, we prayed about how we could accommodate more children. Thanks to the Lord’s blessings and the generous donations of His people, we were able to build a second orphanage, which we opened in late March of this year. The new orphanage is about 15 miles from the first orphanage, and it is now home to the orphan girls whom God has given into our care. The new facility has room for 100 children, so as the need arises we will be able to receive more girls in need. Our original orphanage has become a boys’ home, and with the vacancies left by the girls, it now has room to grow as well. Please pray that as the ministry grows, the right staff can be selected to train the children to serve the Lord. Along with the new orphanage, we erected a school where we currently have over 70 community children enrolled. The Lord also blessed us with a new church building and a clinic on campus. In other locations throughout Kenya, we built four simple metal churches last year for groups that had been worshiping in rough shelters or under trees. The people are so thankful to have a protected place to worship out of the hot sun and the rain. Churches seem to grow more rapidly when they have a house of worship. We pray that these churches will be lights to the community and to all who pass by. In addition to the building projects we have been involved in, we have been able to conduct several camp meetings and prophecy seminars in the last year. During August of 2015, our Bible workers kept very busy holding camp meetings in different churches. At Ekeronko, over 100 people consistently attended the meetings, with 400 attending on peak days. In Kuria, on the Tanzanian border, over 200 people attended, with a good portion of them crossing over from Tanzania to attend. Seeds are being sown which we pray will spring up and bear fruit. Gospel workers with prophecy chart. Our gospel workers from the Maasai tribe have been hosting other exciting outreach efforts: miniature evangelistic meetings in the market places. To attract attention, they simply hang up banners and start preaching. The colorful banners, depicting prophetic symbols from Daniel and Revelation, not only draw people’s interest but also help them to visualize the scenes being preached about. Besides preaching, the workers hand out Bibles and literature to those who are interested. 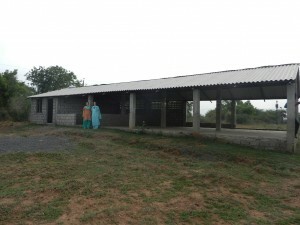 Recently, they informed us that they need a church building for one of the groups with whom they have been worshiping! We praise the Lord for the dedication of these gospel workers and pray that God will continue to use them as witnesses for Him. When we minister to others, it seems the Lord finds ways to minister to us, as well. Recently a nurse anesthetist named Leona blessed us by volunteering for three months here in Kenya. She assisted in the clinics, gave health presentations in the churches and helped at the orphanage. Moreover, she left behind her a huge blessing: help for Evans, one of our best workers in the clinic at Ibencho, Kenya. Last year, Evans lost his arm after being attacked by a man with a machete. He has continued to work at the clinic, but has been hampered by only having one arm. Leona knows a surgeon in the United States who has a prosthesis, and through God’s blessing she was able to arrange for Evans to go to the United States to be fitted with a prosthesis at the very clinic where the surgeon had received his prosthetic arm. We praise the Lord for Leona’s dedication and service, and pray that Evans will now be better able to help the community with their tremendous health needs. 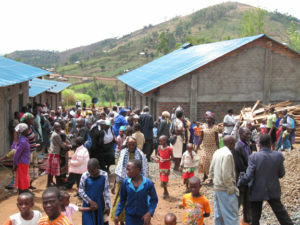 New school with the dormitory for the girls in the background. As we look back on how abundantly the Lord has blessed the work in the past year, it makes us eager to see how He will bless in the next year. This year we plan to add a medical laboratory to the clinic in Ibencho. There is no lab in the vicinity to run malaria tests and other lab analyses to help us determine the appropriate treatment for our patients. To build a room next to the clinic and purchase the equipment will cost approximately $22,000. If all goes well, we hope to purchase x-ray equipment in the future to continue to expand our ability to serve the needs of the community. Even with all the other projects going on, the orphanages remain at the heart of our work. 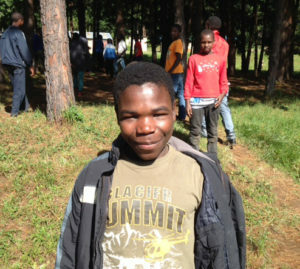 We believe that the Lord has big plans for our orphans, some of whom who are nearing adulthood. 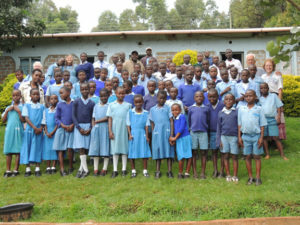 This year, we have 16 high school orphans. Since our school includes only the elementary grades, we send our high schoolers to a Seventh-day Adventist boarding school nearby. This puts an additional strain on our operating budget, but we have found that when we see no way forward, God provides. He has shown us His power in so many ways. We have four students who will graduate this year, and we are praying earnestly about how to help them launch into their futures. In Kenya, parents give their children a piece of land where they can build their own hut and get a start on life; but these orphans have no one to do that for them. We are praying that God will guide us as to how we should help. One of the boys and one of the girls would like to become nurses. The other boy would like to be a teacher, and the remaining girl has not yet decided where she would like to serve. Wherever they may end up working, we pray that they will be faithful and serve the Lord. “Our schools have been established that in them the youth may learn to obey God and His law, and become fitted for service.” Counsels to Parents, Teachers, and Students, 264. We pray that our orphanages will accomplish this divine mission! So many countries of the world need the help of God’s people. May God guide us, wherever we are and whatever work we may be doing, to live the gospel in our daily lives. May the message be preached the world over and may we all be ready to go home soon! By Bill and Becky Humeniuk of Advent Hope Ministries, Inc., P.O. Box 100, Campbellsburg, KY 40011. adventhope@hughes.net. 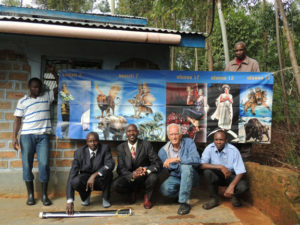 See www.biblesforafrica.com. Advent Hope participates in the Amazon Smile program. If you select Advent Hope Ministries, Inc. for your charity, Amazon will donate 0.5% of all eligible purchases to the work in Kenya, at no cost to you. See http://smile.amazon.com for details. How happy his parents must have been when he was born! Not only was he their firstborn, but he was a beautiful baby boy—a double blessing worthy of the name Gift. Two younger siblings followed soon after, and joy filled the family for those first few years. Then tragedy struck. Gift’s father died, leaving his mother to raise her small children on her own. She had no employment—only a small plot of poor soil to cultivate. Selling produce at the market brought only meager earnings, and money grew more and more scarce. Then another man came into the picture: a divorced father of three. 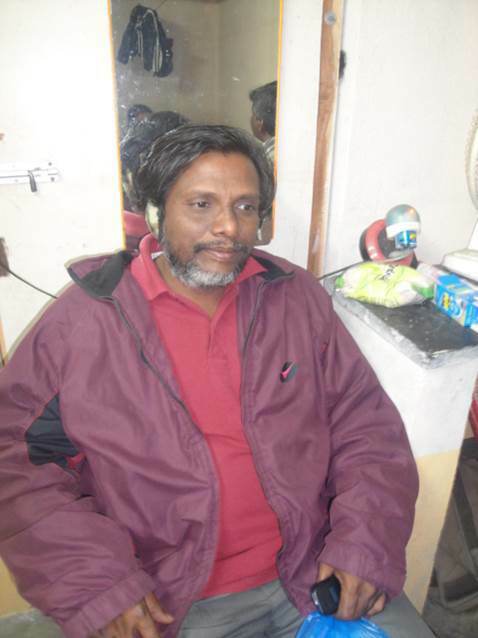 Gift’s mother married this man and soon gave birth to another child. 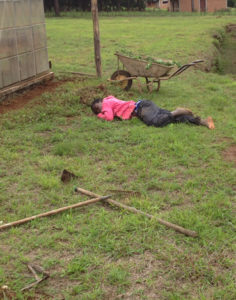 However, life with her new husband was not the same as it had been with Gift’s father, and the mother started drinking pombe (corn alcohol) to help her forget her ungrateful life. Meanwhile, Gift progressed well in school. After primary school, he passed the test to go on to secondary school—a hurdle only about 20% of the nation’s pupils ever cross. Sadly, after his first month of secondary school, Gift’s mother told him that she could not afford to pay the school fees. Gift quit school and remained at home until he heard about a trade school held by missionaries from America. As the fees were much lower than the government schools, his mother agreed to pay so that Gift could become a good artisan. 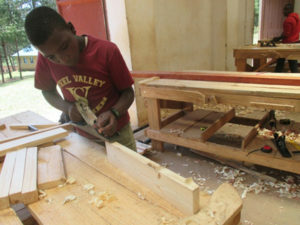 Fourteen-year-old Gift began his carpentry training at Eden Valley Foster Care Mission in March 2014. He was happy to be in school again, and staying in the boys’ dorm was so much better than being at home with a slovenly mother with a haggard face and slurred, abusive speech. Then one day, Gift came to our house with red eyes and a straight face. Fixing his eyes on the floor, he spoke in a sad voice. “Mother wants me to quit school again,” he said. “She said, ‘I have been paying school fees for you and now I do not even have money to buy my pombe! I want you to quit school and find a job as a shopkeeper. I do not want to pay for you anymore.’” Once a precious Gift, this firstborn son had become a mere burden! We looked up Gift’s student bill, and already his account was behind three months. However, Gift wasn’t finished explaining. He said that he had spoken with his aunt in Lupalilo, about one hour’s brisk walk from the school. 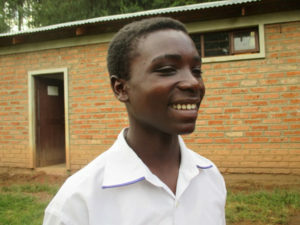 Since the school fees simply cover room and board, Gift was ready to move in with his aunt and walk to school every day. He couldn’t pay his bill, but he truly wanted to keep attending school. We looked at each other. Was the story true? We looked at Gift. He seemed sincere. A deep sadness overshadowed his face. We finally asked him to come back three days later for our answer. Our hearts were torn. In Tanzania, rejection is the daily bread of most children. Babies are adored as the joy of the family; but as soon as they can walk, they are forgotten as another baby comes along and then another. Too often, dirty toddlers and children are left alone while the mother slaves away in the garden and the father spends her earnings in the bar. Gift in his first year of carpentry class. Unfortunately, Gift’s story is a very common one here. That’s why our school is dedicated to orphans and vulnerable children. They all have a story to tell. Quite a few of our students are not able to pay because of their family situations, but if we sent them home, our classrooms would be mostly empty and the school would become useless. Our cook, carpentry teacher, mechanic teacher, sewing teacher and two Bible workers are paid largely out of donations to the student sponsorship program that Gift’s predicament inspired us to launch. For just one dollar a day, sponsors allow a child who can’t pay room and board to be educated at our school. Sponsors make a life-changing difference not only in a young person’s life, but also in that young person’s community. December 6, 2015, our second-year carpentry boys graduated. Among them was our quiet and laid back Gift, now 16 years old. After the graduation celebration, he came to ask us to thank the sponsor who had helped him complete his two years of carpentry training. We had never seen Gift so cheerful and talkative! The next day, as Gift left to go back to Ilevelo, his village, we said a prayer that the Lord would keep him and continue the work He started in him through our school. Most of the boys, having received their own set of carpentry tools at graduation, start a little business at home building stools, chairs, cabinets, window frames, sofas, etc. to sell and make a living. We did not expect anything different from Gift, but God had bigger plans for this young man. When Gift returned to his home, he realized that he was the only Adventist in the whole village. The closest Seventh-day Adventist Branch Sabbath School was two hours’ walking distance from his village—one way. Gift decided that his village needed a church! Going to the local public school, he asked to be allowed to teach Bible classes. At first the school director refused, saying that Gift did not have credentials; so Gift showed him the Bible certificate he had received from Eden Valley Tanzania for completing our 24-part Bible studies. “Why do you want to teach Bible classes?” the director asked. “I want to make converts for my church,” Gift answered. Strangely enough, the director decided to allow Gift to teach two hours per week at exactly the same time as the Catholic Bible teacher held classes. Any students who wanted to would be allowed to attend—but the director stated that he doubted anyone would come to Gift’s class, because none of the students shared his faith. Thus it was that Gift started teaching twice a week with no curriculum but his Bible. After a month of teaching, he had more students in his class than the Catholic Bible teacher had! Better yet, one of the students is now attending the Branch Sabbath School two hours away. Needless to say, the Catholic teacher is furious. Gift recently called us to ask for prayer as well as for materials to assist him in teaching—picture rolls, Bible study sets, pamphlets, etc. At a time when we are so close to the end, it is beautiful to see the Lord use whoever will work for Him! “God hath chosen the foolish things of the world to confound the wise; and God hath chosen the weak things of the world to confound the things which are mighty.” 1 Corinthians 1:27. By Elisha and Nadège Vande Voort of Eden Valley Foster Care Mission. Donations can be sent to Outpost Centers International, 5132 Layton Lane, Apison, TN 37302, marked “Eden Valley Foster Care Mission” or made online at www.outpostcenters.org. I first met Esau Kumar last year in the small village of Jupidi in India where he had previously been running a school. The school had been closed when the government and state rules changed and he now needed state permission for the school to continue. He shared with me his dream of re-opening the school and asked me for financial help to finish building the school. Because the thought of starting a school interested me, I didn’t immediately say no. As an American, I get many requests for financial help in India because they think I am rich, but I have encountered a lot of fraud and people who are often just looking for handouts. For this reason I thoroughly investigate all requests and often have a waiting period before making a decision to help. It was several months later that I decided to go look at his school and found that the land was very nice. However, there was nothing on the property but one simple, incomplete building. It was going to require a lot of work and money—money that I just didn’t have. I didn’t want to close a door that God may be opening, so I asked Esau to get estimates on how much it would cost to fulfill all the government and state requirements to re-start the school. After spending a lot of time and effort, he presented me with all the estimates and the amount was far beyond anything I could afford. The state had given him until a certain time to get the school in working order or he would not receive the permission needed to re-open. After doing some research, I uncovered information that Esau had mismanaged previous proceeds associated with the school, and this was one reason why he didn’t have the funds to complete it. But I still felt God was opening a door and I didn’t want to tell Esau “no.” So I decided to tell him that if he would raise 50% of the needed funds, I would match the remainder. I figured if he was honest then people would believe him and donate money. If not, then I would walk away from the project. For two months Esau had no success raising any money, but he didn’t give up. At this time, I had to return to the United States, so I told him again I would match whatever money he raised. I already had a lot of financial commitments to many other students and projects and decided again to leave it in God’s hands. I believe that just because money is not flowing in, it doesn’t mean that God is not involved. I returned to India the month before the government required the money for Esau’s school. 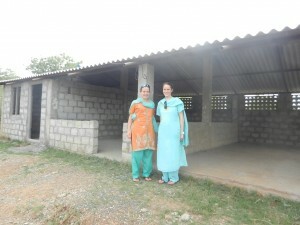 There was a girl named Jessica with me in India for a few weeks. She and I met with Esau at his house the next day on Sabbath, after church. After enjoying a wonderful home-cooked meal prepared by his wife and two daughters, I learned that no money had been raised and nothing had been done on the school. I asked him, “Do you believe that God wants you to start this school?” Without hesitation he answered, “Yes.” I then asked, “Do you believe that God can provide the money to start the school?” Again he answered, “Yes.” So I said, “Let’s go ahead and get started.” Jessica had been listening to the entire conversation and when we left his house, she told me privately that she would donate $100 towards the school. The beginnings of Almighty School. I had told Esau on Sabbath that what we were doing was like stepping into the Jordan River. It was a huge step of faith even though we had no evidence and no money to start any work. I instructed him to get flyers, a banner, and posters printed and to start canvassing the area to let people know that the school would be opening soon, and for them to bring their children on that day for admission. The cost to print these items was $100, exactly the amount my friend had said that she would donate! Soon after that, donations began to come in and Esau was able to pay the government fees and gain permission to run the school. But he was a long way from repairing the building and other things that needed to be done before school could start. 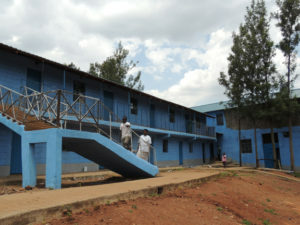 But he started working on finishing the walls for all ten rooms on the ground floor of the school. This was enough to start the school. The school began accepting students. Some come from a nearby tribal village. Their parents are uneducated and their fathers mostly hunt for a living, with bows and arrows. These kids have never been to school before. One mother pleaded with us to please let her kids study there because she wants her kids to be able to read the Bible. The author and visiting worker Jessica. The school needed so much help, and one time I gave $200 out of my advanced salary. I had to somehow get it back or I wouldn’t be eating for a month, but I couldn’t not give it. The next big thing that was needed was a school bus—a necessity for the kids to come to school. And God provided that, too! We were able to repaint it with our school name on the side, but it still needs a couple thousand US dollars to finish paying for it and repairing it. We have a great group of teachers, but still need more student admissions. Esau has named the school “Almighty School” and we ask for your support and prayers for our faith, as we continue through the Jordan. By Rebecca Pomianowski. Email: rpomianowski@gmail.com. To read more about Almighty School and about Rebecca’s ministry, visit www.shelleysenner.wordpress.com. Jovita and Eduardo’s brother arrived at the church seeking spiritual help because they had heard the Seventh-day Adventist message on the radio and decided to find the church. The special Sabbath school class run by the Sister Judibeth, along with the women’s ministry, pledged to visit them at their rural house (Rancho Galeana). They began to give them Bible studies, finding fertile ground for the gospel. Jovita was in great need of spiritual help, because her husband had recently died and Jovita was living with her in-laws who were Catholic. Their doctrine confused her because she thought her husband’s soul was present with her at every moment, and the thought plagued her; so when she received the Bible study on the state of the dead, she understood about the love of God and His teaching and decided to give her life to Christ. However, this meant leaving the house of her in-laws and her job, because she worked in the field as if she were a man. Since her baptism, she has been faithful to her beliefs, even though she might become homeless, relying on the promises of Christ alone. The sisters of the women’s ministry saw her decision and helped her by getting a home for her here in Villaflores and an appropriate job for her. Our foundation immediately took charge and helped her daughter Adrianita go to church school, paying her tuition and buying her uniforms. She was enrolled at the church school known as Harmon White Educational Center, located in Villaflores, Chiapas, Mexico, near the border with Guatemala. There, Adrianita started first grade (equivalent to fourth grade in the United States). As with Adrianita, any child who wants to study in our school is welcome, even if they have no means to pay for their tuition, uniforms and shoes. They just need to desire a Christian education, and by faith our foundation will find the means to support them all. 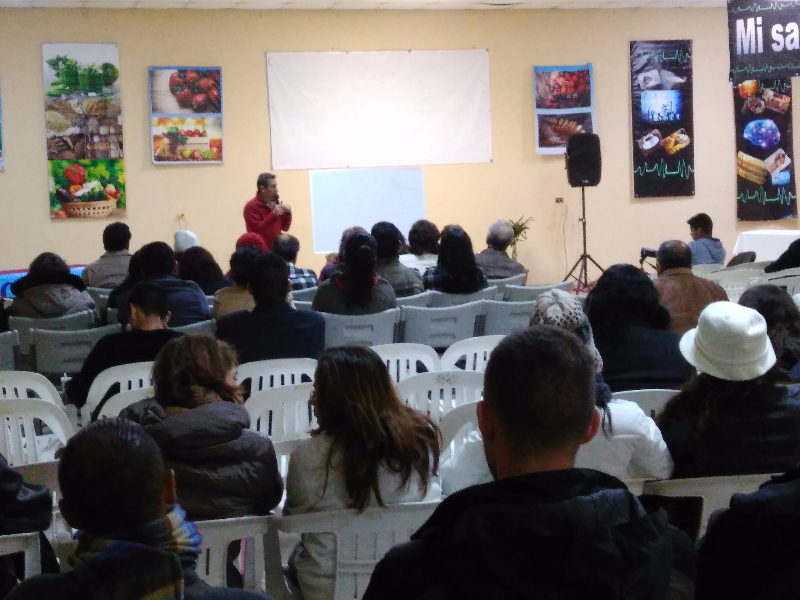 Many poor parents, as well as single, destitute parents or guardians of orphaned children look for Christian education of their children at Centro Educativo Harmon White. The school’s small budget does not accommodate many of the needy children, but we have come to our Lord in prayer and presented all of these children to Him, and we have decided to take as many as can fill the seats in the classrooms. We have experienced growth and an increased number of baptisms and the establishment of several new places of worship due to the humble evangelistic efforts sponsored by our school. The school administration and the teachers continue bringing the gospel and the health message to students and their parents regardless of salary cuts and delays; their love for God and the children keep them committed to this ministry. Jovita and Adrianata with Family. As I visited the Seventh-day Sabbath Church in Colton, CA, Brother Harold Cortes recommended to me for the school to become self-sufficient with a farm and an industry that could support the education of the poor as well as jobs and training of the students in the gospel and health ministry. Also, the church in Colton committed to financially support the project director for two years. After presenting this project to God in prayer, I became acquainted with Pastor John Grosboll and Pastor Nunez from Steps to Life who kindly committed to help with the project. A farm rich in underground water was secured; 323 fruit trees were planted; a building to house the industry was erected; an industrial electric generator was purchased, and a water purification and bottling plant was purchased and delivered from China. The project is almost a reality, but it still needs $4,500 to finance the contract with an industrial engineer to put the plant together and give it a start. “It is of the utmost importance that industrial lines of work shall be carried forward in our schools. The students will find that in genuine muscular exercise there is a great blessing. Let teachers and students be of good courage. Let them put energy into their work.” Manuscript Releases, vol. 5, 438. There are several ways in which you can participate in our project. First, your prayers are much appreciated. Second, volunteers are needed in technical work and assistance in the areas of industry, production, business, distribution, etc. Third, any tax-deductible donation can be sent using the information below. Donations can be sent through Seventh-day Sabbath Church, PO Box 1667, Loma Linda, CA 92354. (Please mark your donations “School Project”). Phone: (909)370-1311.